Please join MALP and Pat Bily of the Nature Conservancy on Saturday, June 7th as we take a step back in time to hike through intact ecosystems and ancient Hawai`ian forests of Waikamoi. We’ll get to breathe in the essence of a Hawai`i before the modern world caught up, as we tread carefully into the Wao Akua, or realm of the gods. When we drive past the upcountry reservoirs at Kahakapao, the symbolic western edge of the East Maui Watershed, we will see how forestry, ranching, and agriculture are all tied together through the need for water, and the commitment from Maui businesses, government, and conservation agencies to protect that source of water. This trip requires a moderate hiking level. The air is thinner, and even physically-fit people can get winded on the trails. Weather is unpredictable, so come prepared (it’s not unusual to have rain in the rainforest). You should be in good physical condition, have a tolerance to variations in weather, and not be afraid to get dirty. Be prepared to stay with your group and hike leader for the duration of the hike. Prior to the hike, please let hike organizers know if you have any physical limitations (such as asthma or other breathing difficulties, allergies, leg/ knee problems, heart conditions, etc). Take necessary medications, especially if they help you with challenges associated with hiking in high elevation, un-even terrain. If concerned about your fitness level please contact Pat Bily to discuss the hike conditions – 856 7665 –But us Landscapers are tough!!! 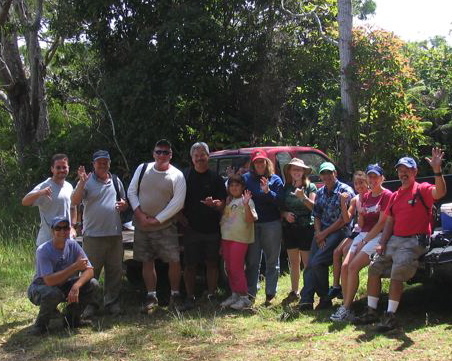 WHERE TO MEET: At The Nature Conservancy Office parking lot, in Pukalani Square Shopping Center, 81 Makawao Ave. If coming up Haleakala Hwy. (route 37), stay left on Haleakala Hwy when approaching turnoff to Pukalani bearing right. Turn right onto Makawao Ave. (the first traffic signal 8 miles past the Hana Hwy. intersection). Proceed for 150 yards, turning right into Pukalani Square. Please do not park directly in front of the shops. The TNC office is on the second floor of the building at the far end. HOW LONG: To give hikers a chance to experience this area, we ask that you allow a full day: meeting up at 8:30AM and getting back to Pukalani by 3PM. The Nature Conservancy (TNC) is a private, non-profit conservation organization with offices world wide. Our mission is “To preserve the plants, animal, and natural communities that represent the diversity of Life on Earth by protecting the lands and waters they need to survive.” We work with other conservation agencies and businesses to enable all concerned parties to safeguard land for future generations. Pay Bily from the Nature Conservancy will conduct a guided tour of the Maile Trail. Lunch provided.